“Those who fail to learn from history are doomed to repeat it!” It was an interesting exercise to find out who said it first as there are various versions. (https://answers.yahoo.com/question/index?qid=20080825183900AACAIkV This and other web references accessed on 2 April 2015. It credits George Santayana, a Spanish philosopher). Learning from history is as important as it is difficult for many reasons. One obvious reason is that learning by reading is much less efficient than learning by experience. Most every one ends up repeating history and (re)learning. May be it is better that way, as even as the 7th billion person in the current world, one has to live the life one had no choice of getting. There may really be nothing more to do other than repeating what someone has done and fail/succeed. One often hears the quote ‘History is written by the victors’ attributed to Winston Churchill. According to the website http://history.stackexchange.com/questions/5597/is-history-always-written-by-the-victors “History is written by victors” may itself be an example of history written by the losers! While the quote is commonly mis-attributed to Winston Churchill, it’s origins are unknown!” I really do not know the history of these statements. Let me tell you about two things that I know for sure. Indian Institute of Science was the result of a dream by J N Tata and this was influenced by the inspirational dialog he had with Swami Vivekananda on a ship. We celebrated the centenary over a whole year during 2008-09. In 2011, we started an undergraduate programme for the first time, 100 years after we started admitting students. The first batch was admitted in 1911. Clearly the students admitted in 2011 are the 101st batch and not the 100th batch! While only some can create history, every one would like to have their name etched in history. 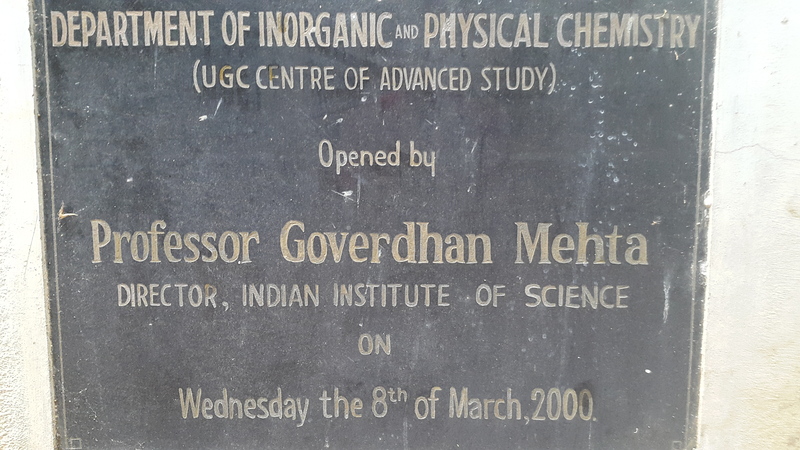 I have been part of the Inorganic and Physical Chemistry Department at the Indian Institute of Science from May 29, 1997. I learned that this was the first Department to be started by the founder Director Morris Travers who happened to be a Chemist as well. Interested readers may go through an article I wrote in Resonance about Travers’ contribution to the discovery of Noble gases. 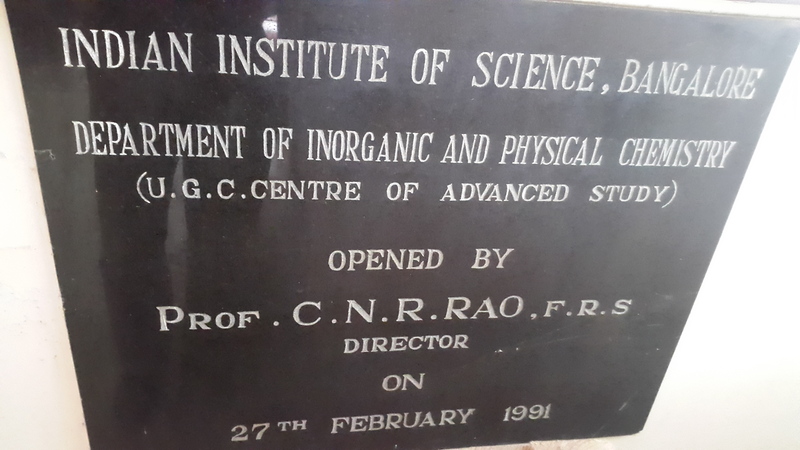 (http://www.ias.ac.in/resonance/Volumes/14/12/1210-1222.pdf) Another Department on Electrical sciences also began and these were the only two Departments initially. I recently found a discussion in Linkedin about the History of Indian Institute of Science started by Meenakshisundaram Ramamoorthy, Chief Engineer at TRIAD OMAN CONSULTANTS INTL. I had not known him personally but somehow was in the circle. He claimed that “Soil Mechanics and Metallurgy were the First Departments to be Set-up.” I had put a comment pointing out the mistake but then there were 100s of comments applauding the authors for the interesting information and one is not clear if all the readers would go through all the comments to find out the truth. I get messages from Linkedin for more than two years about people still reading this piece. There is a book about the History of Indian Institute of Science written by Subbarayappa titled ‘In pursuit of excellence’. http://www.amazon.in/In-Pursuit-Excellence-History-Institute/dp/0074624504. I have heard from our former Director Prof. P. Balaram that there are some inaccuracies in the book though it does give the first two Departments as chemical and electrical sciences accurately. I have witnessed some attempts in the recent years to take credit away from some and attribute credits wrongly to others in the campus. One cannot take anything and everything that is written on paper or even on stone, on face value. One need not mention about the accuracy of what is found on the web, which is readily accessible anywhere and everywhere now. Somewhat coincidentally after witnessing the way politicians, scientists and of course every one else getting influenced by money, I was reminded of the beautiful song in Parasakthi, the first movie of Sivaji Ganesan who might be considered the best actor in 20th century Tamil Cinema by many. The song is ‘Desam gnanam kalvi easan poojai ellaam kasu mun sellathadi “தேசம் ஞானம் கல்வி ஈசன் பூஜை எல்லாம் காசு முன் செல்லாதடி”. It means, ‘the nation, wisdom, education, God, praying rituals would all be secondary to money’ and it is a great song. I thought it was written by M. Karunanidhi who became the Chief Minister of Tamil Nadu and popularly known as Kalaingnar Karunanidhi and Mu Ka. He also had written the story and dialogue for this movie and it became a cult classic. Mu Ka is still alive and active in politics and is close to his 90s. I mentioned this song to some one when I heard about the central Governments decision to withdraw pictorial warnings about the dangers of cigarette smoking. A committee had concluded that ‘no study on Indians has found the correlation between cigarette and cancer’. One does not know if we should laugh or cry. The greatest book on cancer, “The emperor of all maladies” was written by Siddarth Mukherjee, a person of Indian origin. A real scholarly work and a must read for every one including our law makers. Of course, their main concern is the tobacco companies and money. How can one run a party without money. So, I was reminded of this beautiful song. And that brings me back to History. One of my friend contradicted me and said this song was written by Udumalai Naryana Kavi. I was almost convinced of my memory and I checked with my elder brother who is knowledgeable as well and he confirmed it. I thought I would check on google as it is widely known to be aware of everything. I found the song in YouTube and it did not have the lyricist’s name. It had the names of the singer (C. S. Jayaraman) and composer (R. Sudarshanam). Then I found the website, http://www.thamizhisai.com/tamil-cinema/tamil-cinema-001/parasakthi/desam-gnanam.php and it gives the Tamil lyrics in full but gives the singer’s name as Chandrababu! This is certainly wrong and appalling to me. It has the composer’s name correct but the lyricist’s name as Bharathidasan. It cannot be correct either. And then I found another site, http://www.lyricaldelights.com/2012/03/24/parasakthi-desam-gnanam-kalvi-eesan-poosai-ellaam/. This has the song in Tamil, transliteration in English and also a good translation in English. While most of the information is correct, it also has the lyricist name wrong in my opinion. It gives the name as Kannadasan, perhaps the most popular lyricist in Tamil cinema during the 20th century. So much for learning the history of recent events! Buddha seems to have mentioned: Three things cannot be hidden for long: The sun, the moon and the truth! (http://www.brainyquote.com/quotes/quotes/b/buddha133884.html) While I am convinced about the sun and moon and would very much like it to be true for ‘truth’, how can we ever be sure. No wonder, Thiruvalluvar said this ‘எப்பொருள் யார்யார் வாய்கேட்பினும் அப்பொருள் மெய்பொருள் காண்பது அறிவு ‘ Irrespective of what you hear, and irrespective of who you hear from, you need to use your intelligence to see the truth’.